I have been knitting on the picket line, and have listed five scarves for sale on eBay. 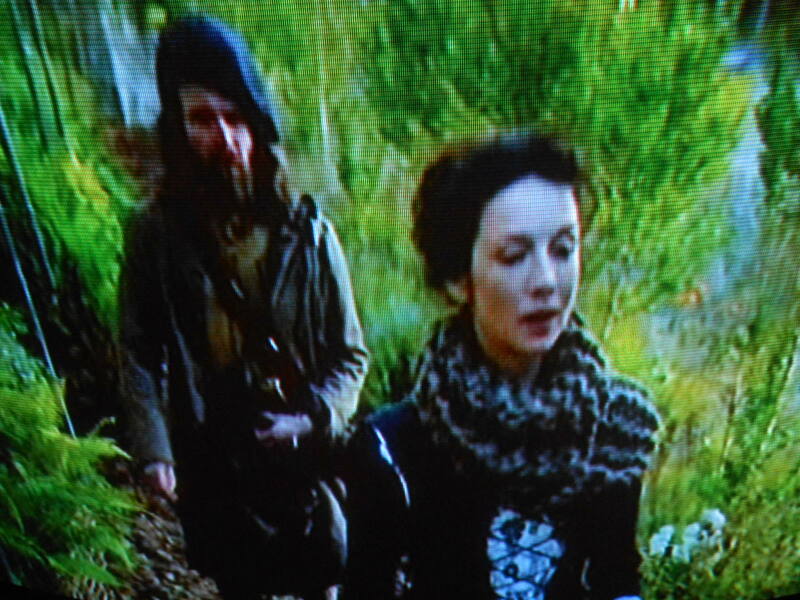 They’re various lengths, widths, and colours, all based on the scarf Claire wears outdoors in episode 103 “The Gathering” of the Outlander TV series. They each start at an auction price of $29.99, or a Buy-It-Now at $40. So that ^ link has expired, but I still have some scarves for sale, so if you’re interested in one, drop me a line via either the ABOUT or CONTACT pages and I’ll get back to you. 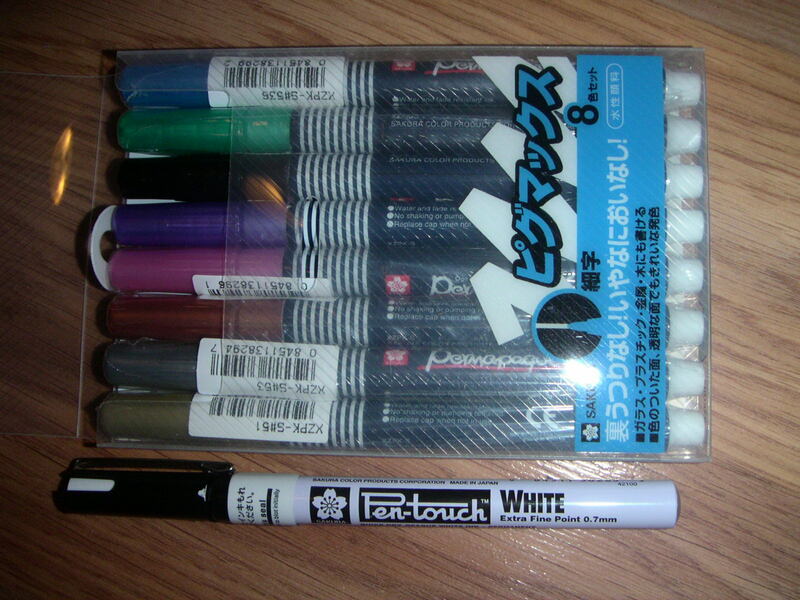 Eventually I’ll try to upload photos to this page. For you crafty types who end up on this page because you want to make one, most of mine were knit in garter stitch over 15-25 stitches (depending on whether you want a cowl that doesn’t wrap, or a scarf that does) using 25 mm needles. To get Claire’s look above pick a chunky yarn of your choice, plus a coordinating worsted weight, use both together to cast on 15-18 (as you like), knit away until you run out of yarn (a meter to 1.5 meters), then whipstitch the ends together. You can add a twist if you like for a mobius strip, which does lie nicely on the shoulders, I must say. Very easy! The costuming department was in a real hurry when they commissioned all these scarves, and I’m not sure I’ve seen one on the show that couldn’t have been knit in a day. I chose fancy chunky yarns- nice German boucles or variegated types to go with a solid worsted. You might prefer all solids like Claire has on. 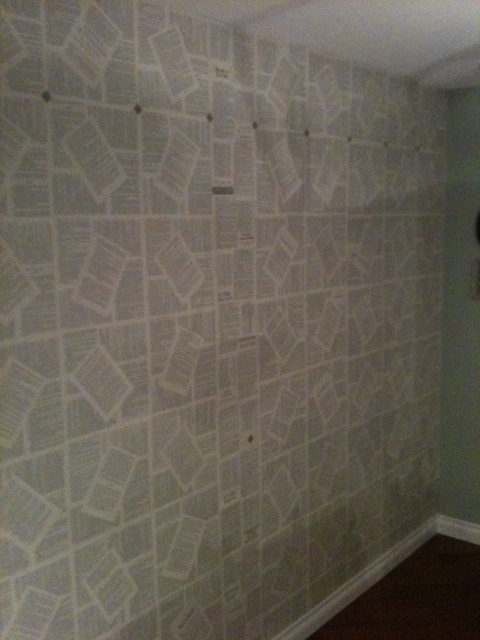 Last weekend I started wallpapering my dining room with pages from a book. I was given a copy of Diana Gabaldon’s Drums of Autumn last fall. I already have a copy, and the gift had a broken binding, so I pondered ways to use it for practical purpose. Today I’m putting the finishing touches on. Most of the wall layout is fairly straight-forward, but I had 9 extra inches that I centred, and there I’ve been playing. 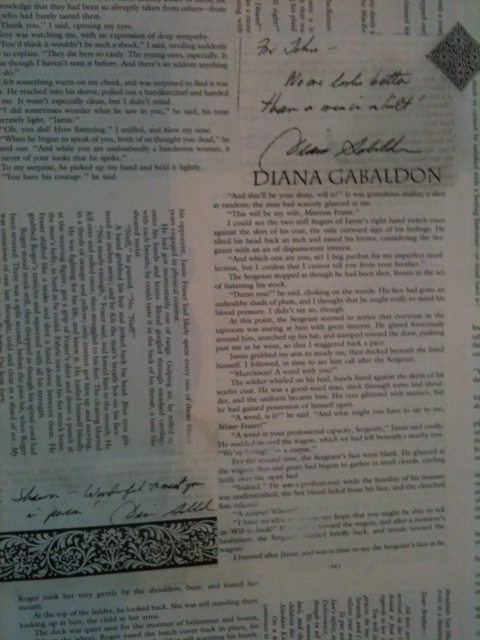 I’ve included copies of autographs we have in other Diana Gabaldon books (copied onto a blank page of the book to match perfectly). 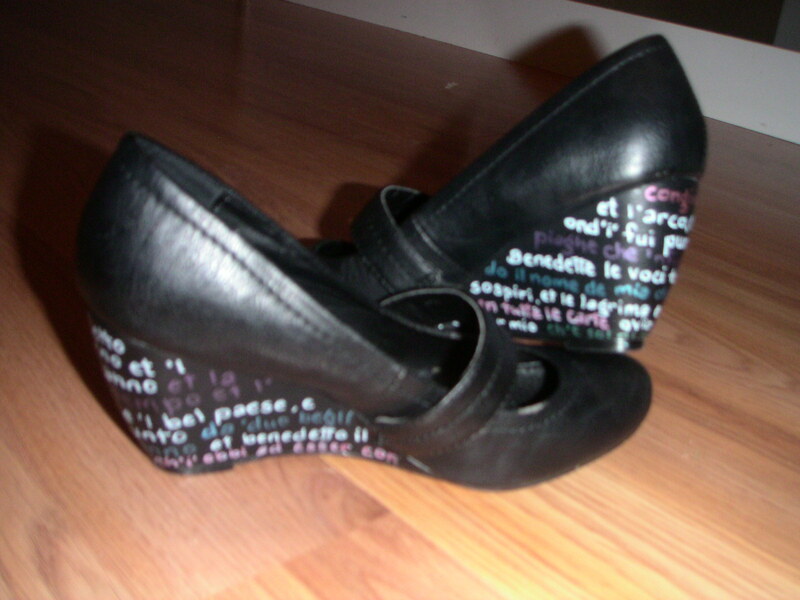 I’ve cut graphic bits from Part divisions and used them decoratively. I’ve taken chapter titles and made them into little poems. I’m really liking my very unique wall! For the first time since Day 4 of NaNoWriMo I am actually above par. Whoo hoo! I should be at 31666 and I’m at 32,058. The last couple of days I’ve done several hundred extra to catch up from some slower days. There is no respite when you’re heading to a goal. If you slow down, you just have to work harder later. Steady, consistent effort is less stressful in the long run. So here’s yesterday’s effort. To get gauge I ended up using 12 mm needles, which is really speeding the project along! Instead of buying the very expensive mohair yarn recommended for this pattern (Elle, total $235 Cdn), I am mixing acrylic yarns. 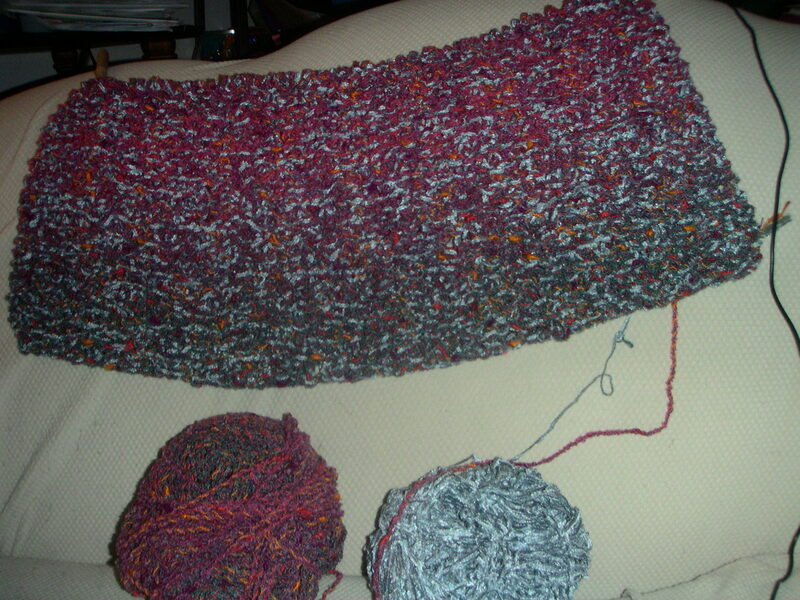 The silver blue chenille I purchased in a liquidation style 5 lb bag of unlabelled yarn at a department store and I am mixing it with on sale James C Brett Fusion Chunky, which is a grey/pink/purple varigated boucle with threads of yellow and orange twisted in. I think the combination is quite interesting, and I suspect it will be even nicer than the model’s coat when it’s done. 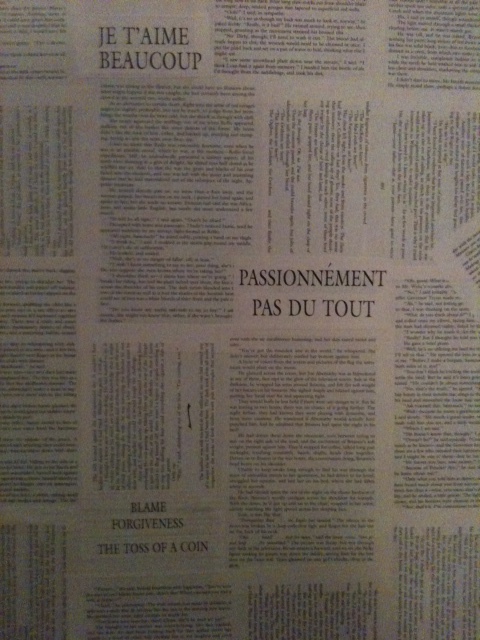 Here’s the first 12″ of the back, showing the varigation through all three colours. Actually, about 800 words of this total was actually written yesterday, but my internet cut out before I could update the count for the day. I have seen The Kilt worn. It is good. 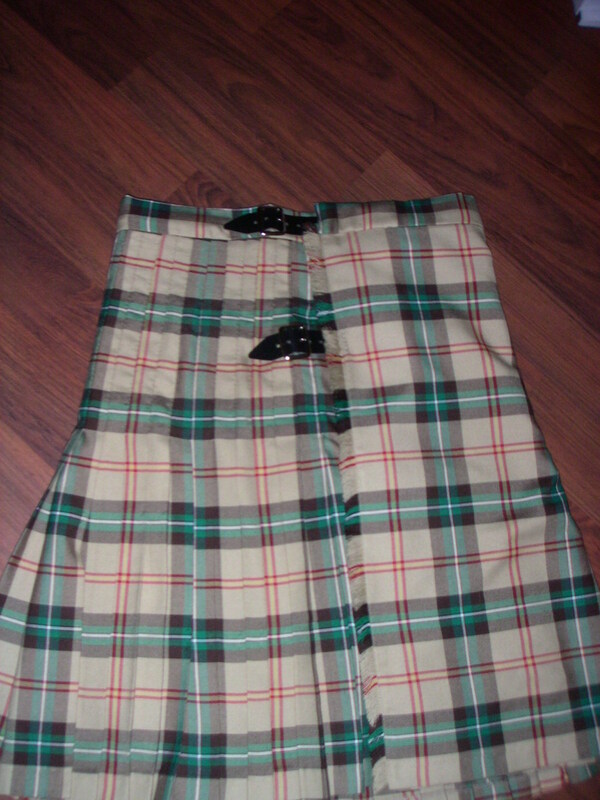 The way the pleats fit smoothly from waist to hips, accenting the slight curve. 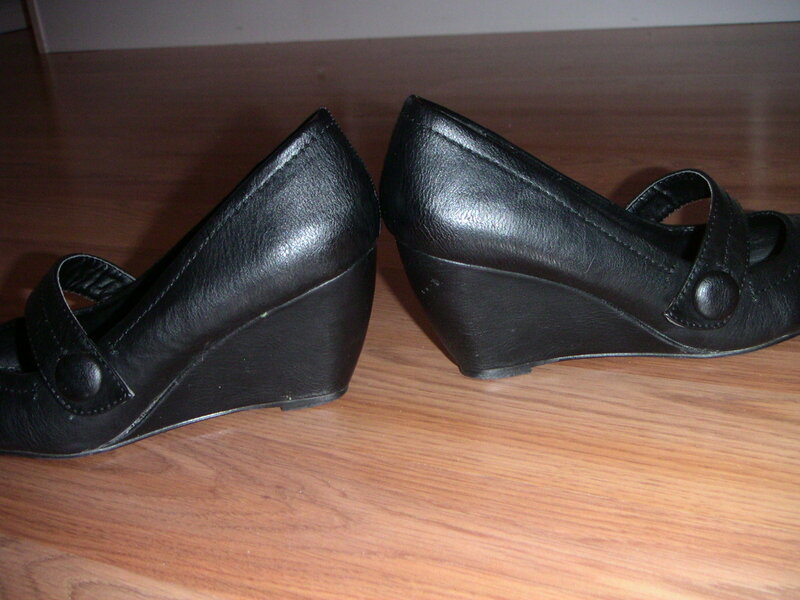 The way the pleats swing with the stride. The way it accents the positive. After I stopped laughing, I moved up the chain, and then investigated proper sporran placement at X marks the Scot and the Tartan Authority. 2-3″ below the belt buckle is correct for the top of the sporran, apparently. We’re still waiting for the arrival of the belt and buckle, but I think we’ve got it close. I have seen. It is good. 15. sigh dramatically as spouse models completed kilt! Today, the straps and buckles arrived from Scotland at last, and so I was able to finish off the kilt. I started by sewing down the waistband. You’re supposed to match the plaid across the front apron. If you look closely, you’ll see that the very centre matches, but the print on the band is smaller than the apron. This is because while it turns out the the Saskatchewan tartan is balanced left to right, it isn’t up and down (though it looks like it is!). I needed the full width (divided in half) of the fabric for my tall husband, and so I was forced to cut the waist band from the end. 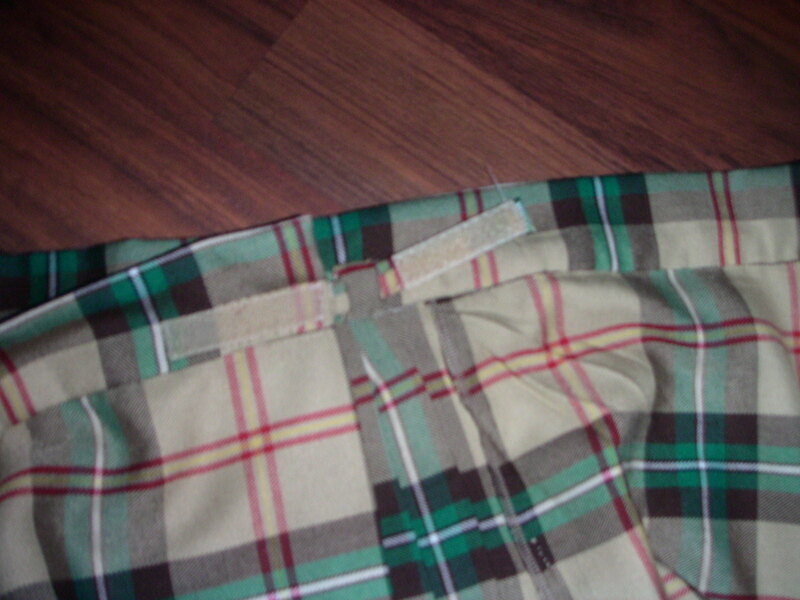 I made the under closure with a strap of velcro on the apron that connect through a loop on the inside of the kilt. The leather straps from Scotland needed stitch holes, so I used my Dremel drill to make them. 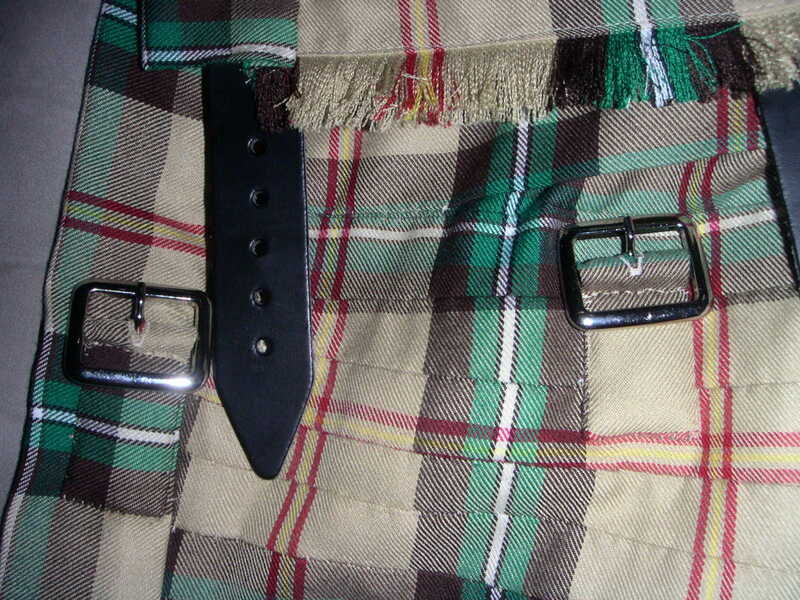 The buckles are attached using fabric straps, that are matched to the plaid. 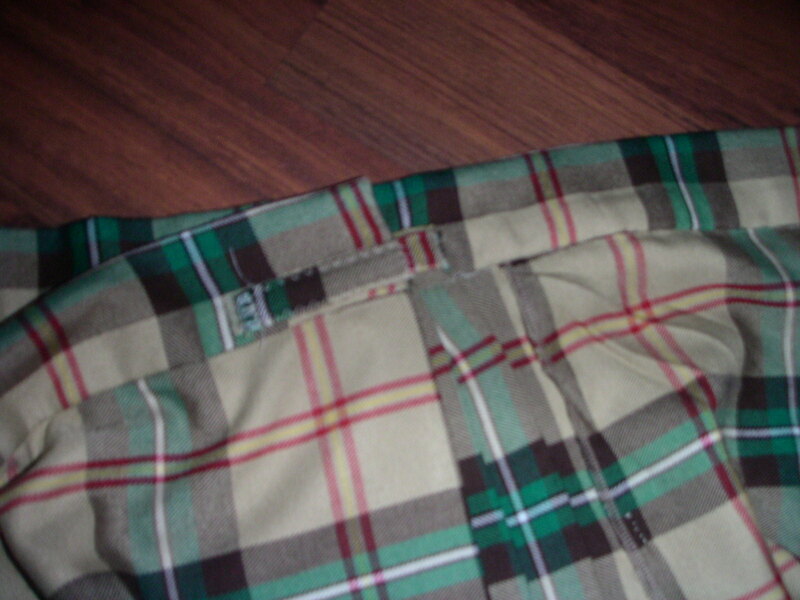 The hole for the buckle prong is a half inch button hole. The fabric straps are hand stitched down, and well camouflaged. And that’s it! My first kilt is complete! After some 30 hours of ironing and stitching by hand and machine later, the project in Saskatchewan tartan is complete. The sporran has arrived from Scotland via eBay, as has a pair of “Lovat green kilt hose.” The garters and a set of flashes are done. Now, we have to wait for my November 22nd Scotsweb order. Apparently the kilt belt is still not in, and the order won’t be shipped until Friday (December 9). A clan crest buckle, ecru hose, and a kilt pin will arrive with it. An additional purchase was a kilt hanger. 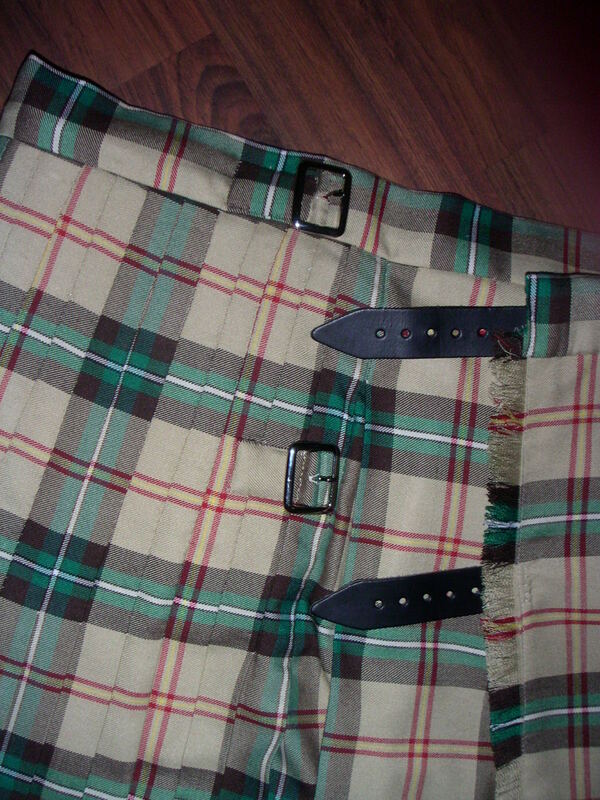 A regular skirt hanger can’t take 3 lbs of kilt, but a kilt hanger is wider and has 4 clamps. With luck, we should be able to completely outfit the husband of the house in his finery by Christmas. Stay tuned!